Soekarno-Hatta International Airport Jakarta (Tangerang, Banten) is busiest airport in Indonesia with more (or almost?) than 1000 take-off landing everyday. I just got picture posted by my friend Michael Sambur in his Facebook account when (maybe) he ready to take-off to somewhere. Air traffic jam not only happen in Indonesia. Changi Airport SIngapore as one of busiest hub in South East Asia also got air traffic jam. I ever fly from Kuala Lumpur (KUL) to Singapore (SIN) with Jetstar and when approaching SIngapore, pilot said that we will go around about 10 minutes waiting for landing queue. 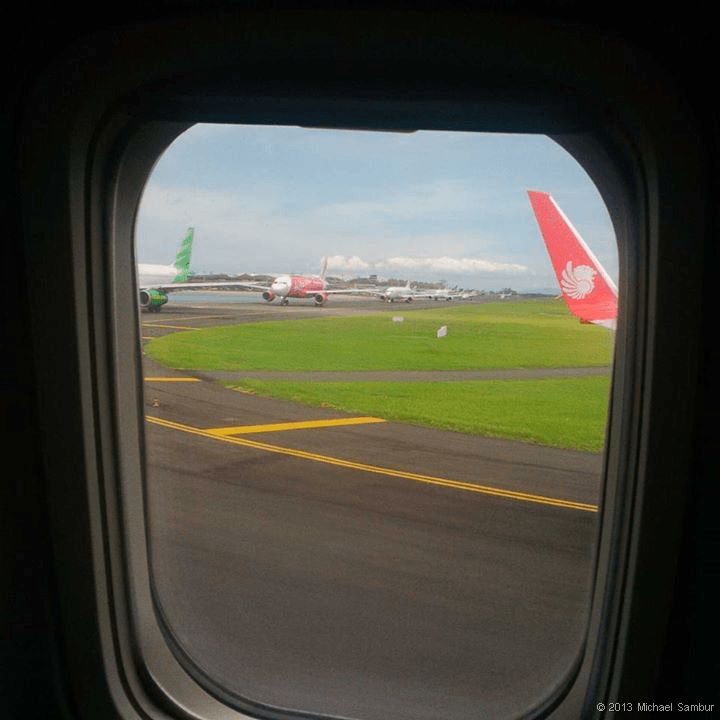 I was on the flight From Jakarta (CGK) to Yogyakarta (JOG) this year by Garuda Indonesia when we go around for about 30 minutes on the air and pilot said that it was because no parking slot available at the airport, so we wait for another aircraft to take-off. I ever on the taxiway for more than 40 minuter just wait to take-off for 50 minutes flight. That’s not included with traffic jam on the way to Jakarta airport that make me spend more than 3 hours on the road for just 40 km distance. That was a lot of fuel burn. With fuel consumption is about 50 litres per minute for narrow body aircraft like Boeing 737-800 or Airbus A-320, 10 minutes delay on air will make airline spend more than USD 500 just to burn fuel. This is just for 1 aircraft with mid size. What happen if it’s more than 100 aircraft and with bigger size? With risk of flight delays and cancellations are at an all-time high, I think the airport authority need to have more runway and more terminal building to serve more aircraft. Or maybe we just need more airport?